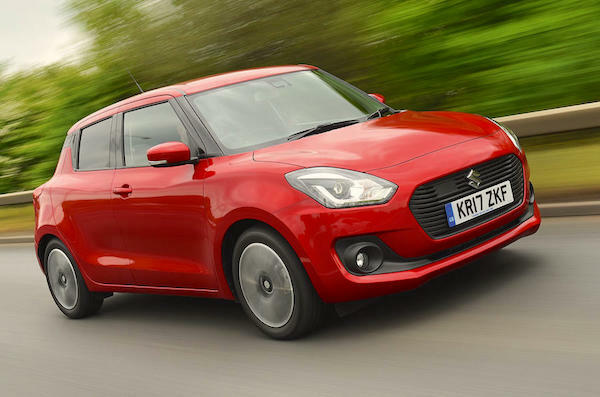 The Suzuki Swift is up 38% year-on-year in New Zealand. The New Zealand new vehicle market edges up 1.2% year-on-year in August to 13.200 registrations, a new record for the month eclipsing the previous best of 13.157 established 34 years ago back in 1984. This lifts the year-to-date tally up 1.7% to a new record 105.516 units after 8 months. Passenger cars including SUVs are up 0.4% to 8.639 while commercials are up 2.4% to 4.561. Toyota (-9%) struggles this month but conformably remains in the leading spot at 17.4% share, distancing Ford (+9%), Mazda (-0.2%) and Mitsubishi (+14%). Hyundai (+42%) by far manages the largest year-on-year gain in the Top 10 with Suzuki (+16%) also in great shape and Volkswagen (+5%) outpacing the market at #10. Further down, Chinese LDV (+41%) continues to shine at #15, with Haval (+767%), Volvo (+82%), Jaguar (+58%), Lexus (+43%) among the most dynamic. The Ford Ranger (+14%) further increases the gap with its archenemy the Toyota Hilux (-11%) while the Toyota Corolla (+11%) climbs back up to #3 as the summer season (and rental sales push) is now approaching. The Holden Colorado (+11%) and Mitsubishi Triton (+24%) are both very dynamic but get knocked down one spot by the Corolla, the Nissan Navara (+11%) makes it five pickups in the Top 7 as the Suzuki Swift (+38%) and Mazda CX-5 (+36%) post the largest gains in the Top 10, with the Hyundai Tucson (+27%) and Mitsubishi Eclipse Cross (#23) also impressive. Full August 2018 Top 70 All-brands and Top 30 models below.